Mozilla’s next major browser update has arrived. Firefox 57, as it’s sequentially known, is such a drastic improvement over its predecessor that Mozilla has christened it Firefox Quantum. The new browser is said to be noticeably faster. 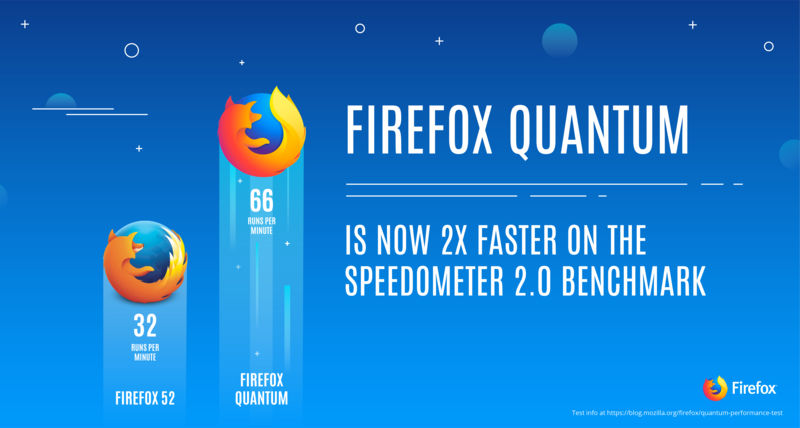 In Speedometer 2.0, a benchmark that simulates modern web applications, Firefox Quantum is roughly twice as fast as Firefox was a year ago. As highlighted in the video below, the new browser often appears faster than Chrome. Results will vary, however, based on the computer and apps you use (and remember, the video is from Mozilla so of course it’s going to paint Firefox favorably). As Mozilla’s Nick Nguyen notes, Firefox has historically been powered by a single CPU core. That changes with Quantum as it takes advantage of the multiple CPU cores in today’s desktops and mobile devices much more effectively. The browser also utilized a new CSS engine written in Rust that runs parallel across multiple cores instead of running in one slower sequence on a single core. According to Nguyen, no other browser can do this. Mozilla has also tweaked Firefox to give priority to the tab you’re actively using. This, along with Firefox’s “just right” multi-process architecture, makes for a speedy experience that reportedly consumes roughly 30 percent less RAM. For a browser with a history of being resource-intensive, that is good news. It doesn’t end there, however, as an internal initiative designed to zap instances of “slowness” you might encounter in Firefox has resulted in the correction of 468 such issues. Matters addressed range from “small paper cuts” to “big bottlenecks,” Nguyen notes. Firefox is also getting a visual makeover. Dubbed Photon, this new user interface is said to feature a modern, minimalist design that puts users’ needs first. For example, if you’re using a Windows PC with a touch display, Firefox menus will change size based on whether you click with a mouse or tap with your finger. Photon also introduces square tabs, smooth animations and a library where you’ll find saved content like downloads and screenshots. Pocket, the read-it-later app that Mozilla acquired earlier this year, now comes fully integrated into Firefox. When you open a new tab, you’ll see your top sites as well as trending pages recommended by other Pocket users. And if you use the Pocket app for your mobile device, you’ll get offline access to saved stories on the go. Firefox Quantum hits the public channel on November 14 although you can skip the wait if you are willing to try the beta – out now for desktop, Android and iOS devices. Devs, meanwhile, are encouraged to give the developer edition a whirl as it includes new tools for those that build content for the web.